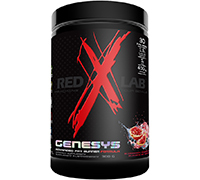 Genesys is an advanced fat burner formula. Genesys is an advanced fat burner formula. This unique supplement increases the maximal rate of fat oxidation during exercise, helps in the preservation of lean mass, increases energy levels and reduces the metabolic stress of exercise therefore promoting a quick recovery between workouts. Studies prove that Teacrine® improves alertness, selective attention, information processing and neuromotor performance. It may increase exercise capacity and physical endurance, as well as the motivation to exercise. TeaCrine® also helps sustain mental energy. Further studies effectively demonstrated that there is a definitive increase to the benefits of TeaCrine® when used in combination with Caffeine. How to use: Mix 1/2 scoop (5 g) in 3 oz of water immediately before consumption. Consume 15-30 minutes prior to exercising. Take twice daily.